Classic comic book characters often have different artists that get associated with them. The artist who designed them in the first place, those who redesigned them in their most popular years, those who’ve done their stories during the hottest runs. Carmine Infantino was one of those great artists, taking the golden age character the Flash and redesigning him, creating the costume that’s still the basis for the character’s look today and, frankly, is one of the greatest comic book costumes of all time. 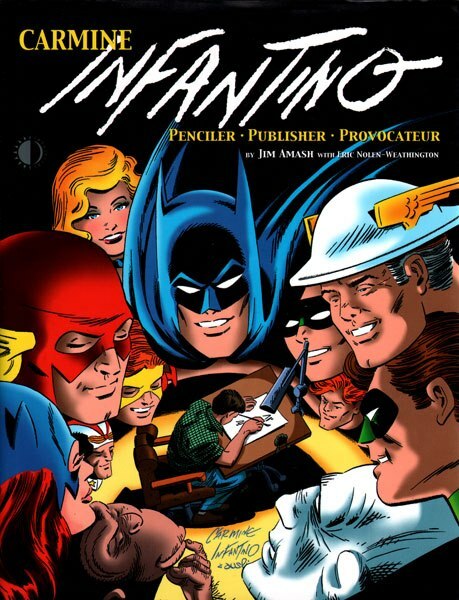 Infantino also became an editor at DC Comics, then later still, publisher of the company from 1971 to 1975. He kept working throughout this period, co-creating the Human Target with Len Wein and doing work for the legendary first meeting of Superman and Spider-Man. He kept working in later decades for DC, Marvel, Warren Publishing and other publishers, drawing newspaper strips, and teaching at the School of Visual Arts. In a poll by the Comics Buyers’ Guide, he was ranked one of the greatest comic book artists of all time. Like all greats, he had to leave us some time. To me, Infantino is one of those artists whose work is firmly, inextricably linked to a specific character… Curt Swan’s Superman, Neal Adams’s Batman or John Romita Sr.’s Spider-Man, for example. I still think of those as the definitive, archetypical versions of those characters, the one that all other artists should use as their template. Every artist who’s ever picked up a pencil to draw the Flash owes a debt to Infantino. May he rest in peace. So by now you’ve read the end of the Reel to Reel Christmas Special, and you’ve downloaded and loved The Ghost of Simon Tower, and you’ve opened your presents and roasted your chestnuts and decked your halls and mistled your toes. So what’s left to do on this Christmas? Well, just to keep you entertained, here’s a gallery of some of the Christmas comics that have come across my laptop this year, including a whopping 30 that I reviewed over at CXPulp.com. Merry Christmas, everyone! Amidst all the joy and chaos of Comic-Con last week, there was a bit of news that should be of interesting to anyone who, like myself, spends time thinking about the health and future of the comic book industry as a whole. 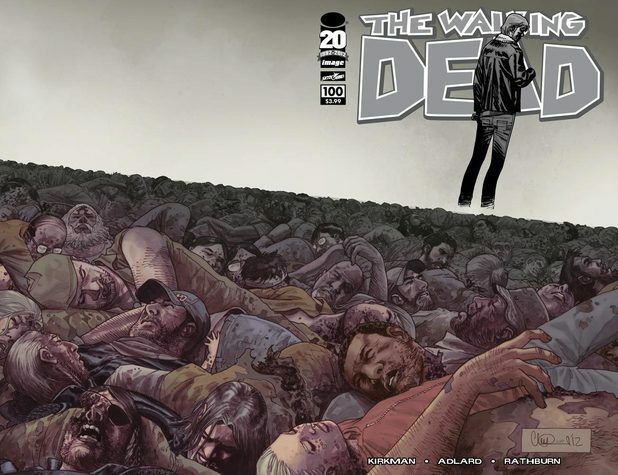 The Walking Dead, Robert Kirkman‘s little zombie comic book that turned into a massive hit and a gargantuan TV show watched by millions of people who have no idea it’s based on a comic book, hit issue #100 last week. In the current marketplace, where the two largest publishers restart comics that have been around since the 30s with a new #1 every time the main character changes his socks, hitting 100 issues in and of itself is pretty impressive. It’s even more impressive when you consider that this is a black-and-white character drama disguised as horror, rather than the four-color superhero comic that has dominated the industry since the 60s. And most impressive of all were the sales numbers — over 380,000 individual units sold. To put this in perspective, this is the best-selling single comic book (not counting reprints) since 1997, and we currently live in an era when a single comic book hitting 100,000 is something to be celebrated. And finally, there’s the question of the TV audience — how many people who started in with The Walking Dead as a TV show have migrated to comic books? Statistically, there really hasn’t been any significant, long-term sales bumps for any comics that have movie or TV adaptations in the last few decades. The Walking Dead has been an exception, though. Comic shop owners have reported increased sales on the trade paperbacks of this title since the show launched, and they’ve continually grown higher and higher, along with sales of the monthly comic book. Is this huge #100 bump helped by TV viewers who are using it as a jumping-on point, or who have caught up in the trades? Any comic book selling that many copies in the current marketplace, for any reason, is good news. But I think it’s going to be a lot more interesting to see how many copies issue #101 sells. This isn’t the end of the story, friends. Hopefully, it’s just the beginning. It’s July, and once again, it’s the week of the annual San Diego Comic-Con. And once again, I’m not there. The annual mecca of comic and pop culture once again rolls on without me, as it has since time immemorial, and I do as I always do, watch the news roll out from home. Granted, Comic-Con isn’t quite what it once was. I agree in large part with my buddy Adam, who earlier today made a very succinct post about how other media have taken over the event from comics, and calling upon creators to make an effort to visit the smaller regional cons for the sake of the vast majority of fans who just can’t make it to San Diego. That would be wonderful. But at any rate, it won’t be this year. So if you’re there, help out the rest of us. We live in a world of Facebook and Twitter, so post pictures of awesome displays and cosplayers, tweet the news at it happens, and let the rest of us all know exactly what we’re missing. I promise, if I ever make it, I’ll do the same for you. So in July, DC is reviving the Golden Age title National Comics. This book, DC says, will consist of single-issue stories by different creators showcasing a different character each month. Basically, just like their DC Universe Presents series is a way to do miniseries without calling them miniseries, National Comics will be a chance to do one-shots without calling them one-shots. I’m really very much in favor of this. DC has so many great characters that haven’t been revived yet, and this is a fine chance to get to more of them in a short period of time. If reaction to a particular issue is very good, they can bring that character back in another issue, or a miniseries of his own, or even kick off a new ongoing. It’s a (slightly safer) way to test out characters, and while it’s true that anthology titles haven’t performed very well in the last few years, I still appreciate them as a chance to try new things. Granted, DC will also be able to use this to renew trademarks on several characters, something that I’m sure hasn’t escaped their notice, but I’m going to be positive. This could be a great opportunity to tap into an enormous reservoir of characters, not just those that originated from DC Comics, but those libraries of other publishers that they’ve bought up over the years — Fawcett, Quality and Charlton Comics, and Jim Lee’s Wildstorm Studios are all eligible to be part of the DC Universe. And what’s more, this could even be a good opportunity to try out new writers and artists. Guys who impress them at a convention portfolio review. Small press creators who have shown an interest in working in the mainstream. Maybe even humble internet reviewers and columnists who also happen to have authored a well-received superhero novel available for just $2.99 on the Amazon Kindle, not to mention two short stories and an upcoming prequel novel set in the same universe. Man, I would love to see a guy like that take a crack at an issue or two. Comic and Animation Fans: The Pittsburgh Toonseum needs your help! Hey, everybody. If you’ve never heard of the Pittsburgh Toonseum, it’s a nice little site in the Steel City that hosts great displays of comic book and cartoon art. I’ve visited a couple of times and always enjoyed it. After a flood last week at an offsite storage facility, the Toonseum lost a lot of books, comics, exhibition reproductions and equipment (although, thankfully, no original art). The Toonseum has a donations page on their website, and they’re currently asking for help to recover from this lousy bit of bad luck. Any help you could provide — including donating some money (a tax-free donation, by the way) if you can or just passing the link along to other websites and Facebook pages — would be greatly appreciated.